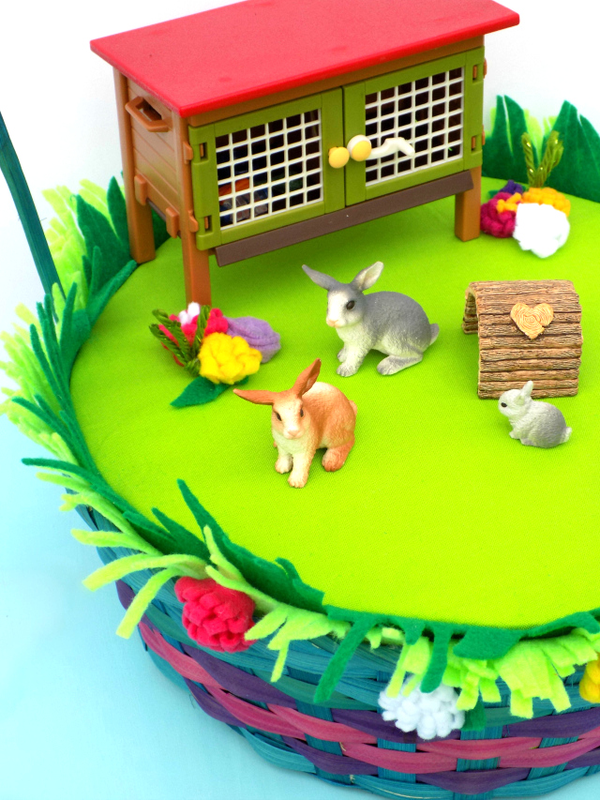 One Savvy Mom ™ | NYC Area Mom Blog: Reusable Felt + Fabric DIY Easter Basket Grass Alternative #ILikeSchleich + A Fun Contest! This post is sponsored by Schleich®. All opinions expressed are my own. With Easter just weeks away, it's time to start thinking about Easter basket treats for the kids! This reusable felt and fabric DIY Easter basket grass alternative is so incredibly easy to put together. When complete, it sets a super cute stage for one of my favorite non-candy Easter basket treats for kids too; Schleich ® Farm World figures and play sets! While I absolutely adore the entire collection, the Rabbit Hutch play set, Shiba Inu Mother and Puppy, Rabbit, Rooster and Lamb figures are great for gifting this Easter holiday. Moment of honesty? Friends, I've forgotten the lovely shredded Easter basket grass the past few years in a row now. At the eleventh hour, I've simply wound up using whatever I've had on-hand to add a bit fluff to the bottom of the Easter baskets. Year after year! Not this year though. I decided to prep a little early for the upcoming Easter holiday by making a super cute reusable alternative to Easter basket grass, with a handful of supplies that I already had on-hand. My favorite part? Look how super cute the Schleich figures and Schleich Rabbit hutch play set looks presented atop this reusable Easter basket grass insert! Just adorable. 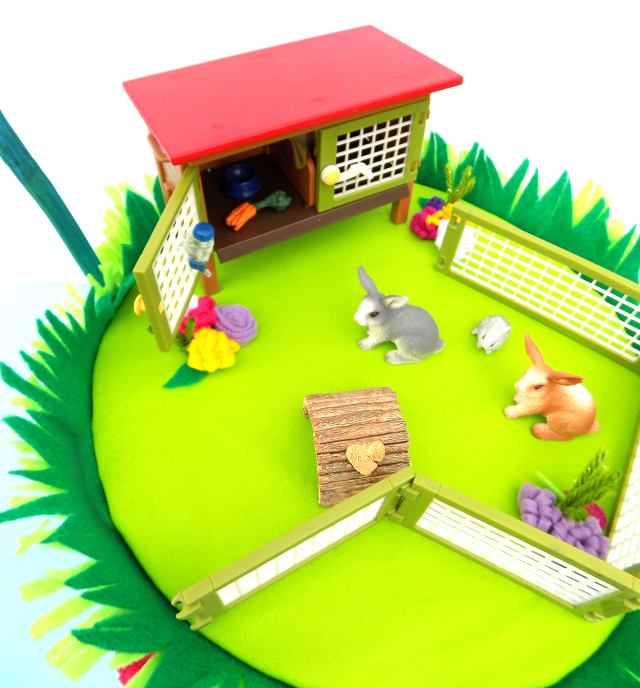 The Rabbit Hutch play set is so perfect for Easter. It comes with the the rabbit hutch, a faux log tunnel, rabbit figures, a fence and the cutest accessories for endless hours of imaginative play and learning fun. 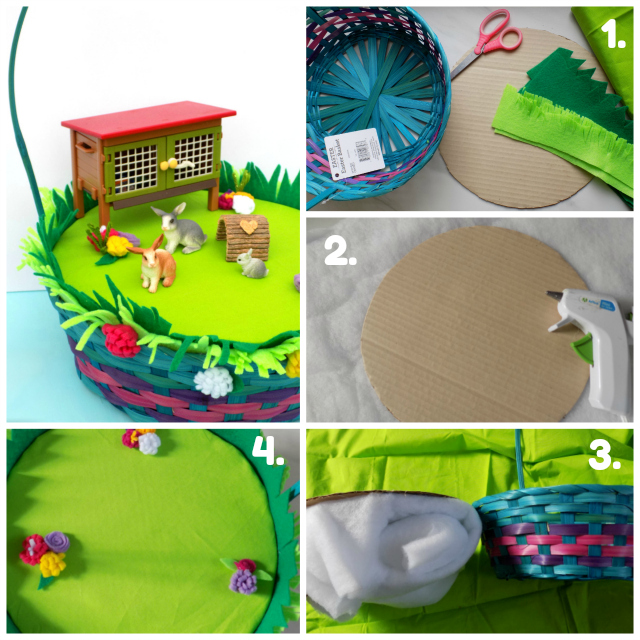 Ready to make your own reusable felt + fabric DIY Easter Basket grass alternative? Grab the full supply list and step-by-step instructions below. 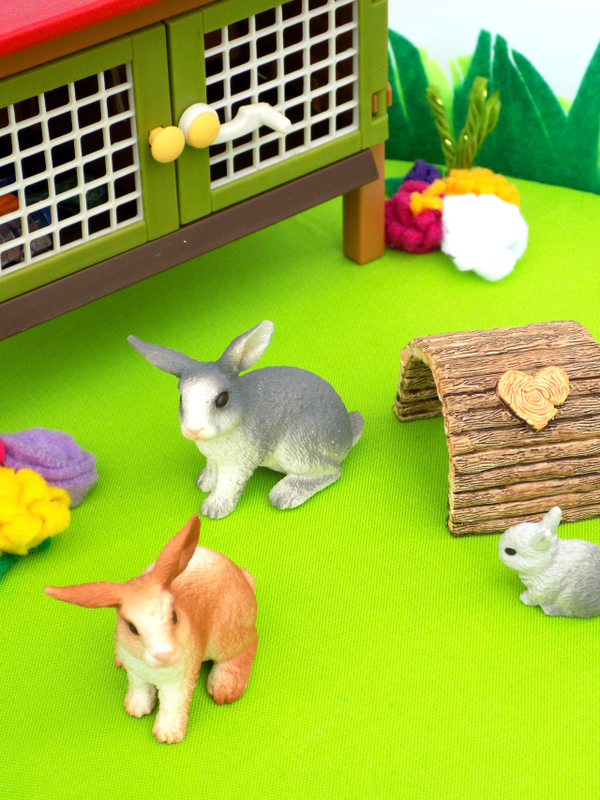 Start by prepping all of the pieces for your reusable felt + fabric DIY Easter Basket Grass alternative. Trace the outline of the bottom of your basket onto your up-cycled cardboard, using a pencil. Cut it out. Cut your green felt into 3 equal strips (lengthwise.) Cut your light green felt into 3 equal strips (lengthwise.) Fringe or scallop the top edges of each felt strip (refer to imagery above and below. Lay your batting out. Add a few generous dabs of hot glue to your pre-cut cardboard form. Set your pre-cut cardboard atop the batting. Press lightly until the glue has set. Now, gather the outer edges of the batting and fold inwards (towards the bottom,) making sure that the gathered batting adds a height that is about equal to the depth of your basket (refer to image 3 above.) Add a few large dabs of hot glue to secure gathered batting. Lay out your green fabric. Place the cardboard form (cardboard side down) into the center of your green fabric. Pull / gather the fabric into the bottom center (tightly around the gathered batting.) Secure with a few large dabs of hot glue. Hold fabric firmly in place until dry. Affix the previously cut fringed / scalloped felt "grass into the top inside edge of the basket, using several dabs of hot glue. Once your felt grass is in-place, add a few large dabs of hot glue to the bottom of your basket and place your fabric insert (hard cardboard platform side up and batting side down.) Allow glue to set. Optional: Add small fabric felt flowers and small knotted green yarn "tufts of grass" using scrap felt and yarn. Hot glue and hold in-place until glue has set. 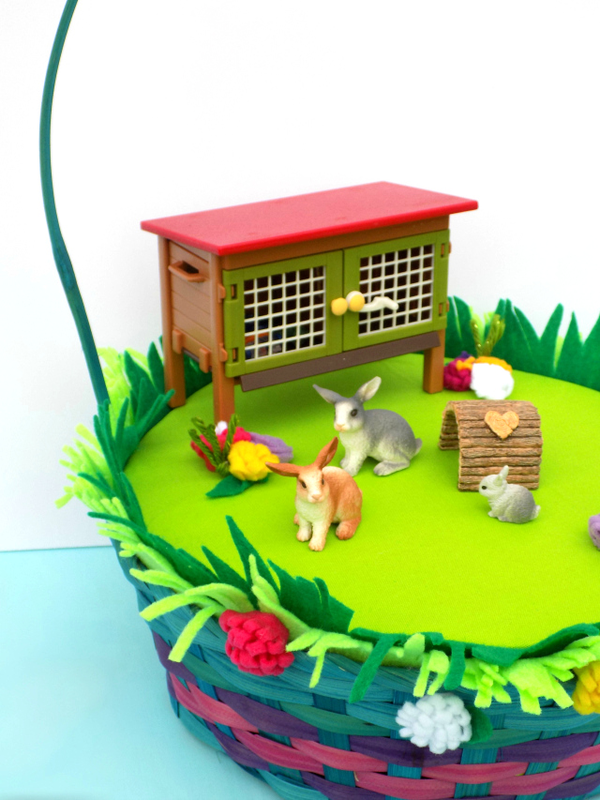 Once glue is dry/set, arrange your favorite Schleich figures / play set(s) atop your reusable felt and fabric DIY Easter basket grass insert, gift, and enjoy! 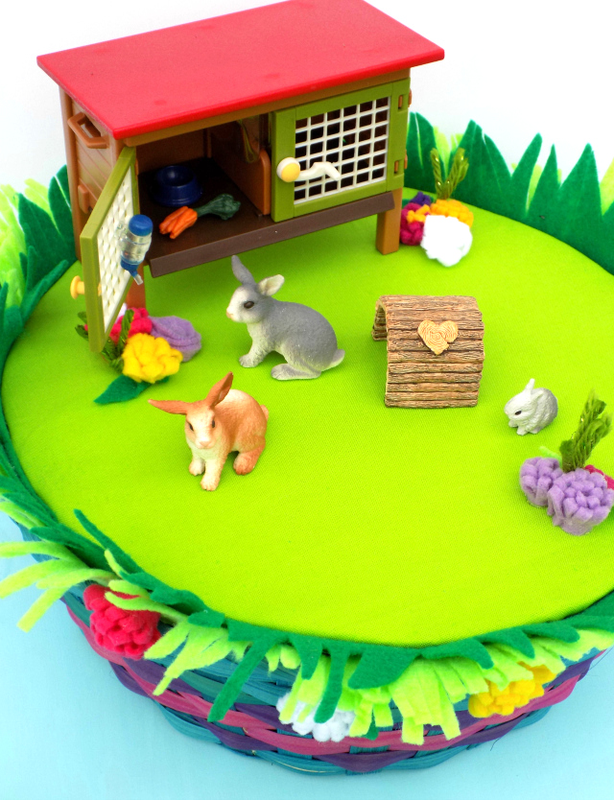 Such a super cute Easter grass alternative that can be used again year after year! Ready to have some Easter fun with the kids? Find the Schleich Red Rabbit, and WIN! With a bit of luck, you could win one of 20 Schleich play sets! 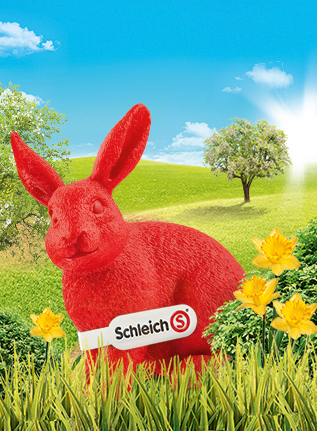 Look for the Schleich Red Rabbit on the Schleich shelves at participating stores in your area. Snap a selfie with the Red Rabbit. Upload your Red Rabbit Selfie as a comment to the Red Rabbit post on the Schleich Facebook Page (must be a legal U.S. resident, and the individual uploading the photo must be at least 21 years of age to enter.) The terms and conditions for the competition can be found HERE. All photos uploaded between 12:00 AM on March 18 and 11:59 PM on April 28 are eligible for a chance to win. Each week, five lucky entrants will be selected to receive a Schleich play set. Winners will be announced 4/5, 4/12, 4/19, 4/23, and 5/3. All entrants will be entered into a drawing for a grand prize play set, also announced on 5/3. Happy crafting, happy spring, and happy Easter, friends! My little girl loves all the Schleich farm animals. This is so cute. I love finding new reuseable items. Thank you! :) Happy Spring, Marisela! This is an adorable idea. You are so creative!